Making the Mold: The molding material is cool setting, nontoxic and non allergenic. Wiggling is not a problem as long the hands remain submerged in the molding gel until it sets. The set time is about 6 minutes, which includes the mixing time. LARGER SIZE! Taller and wider bucket plus more molding & casting materials! CAST HANDS: 2 Adult hands, 2 Adults + 1-2 small children; One large adult hand, Child & Adult, or 3-4 Young Children. See the Luna Bean -XL- kit if you need a larger size for up to 4 adults plus 1-2 children. PRESERVE EVERY PRECIOUS DETAIL! The unique rubbery mold captures every fine line and fingerprint for a perfect one of a kind treasured gift. The Step 1 aginate molding material is custom to Luna Bean kits. Slower set, better deteil and more bold color changing properties than other craft brands. MADE IN THE USA ... A FUN and MEMORABLE gift activity for family, couple holding hands, and friends to create a PRICELESS memory. Great for an anniversary, engagement, valentine's day, mom, dad ,or grandparents. 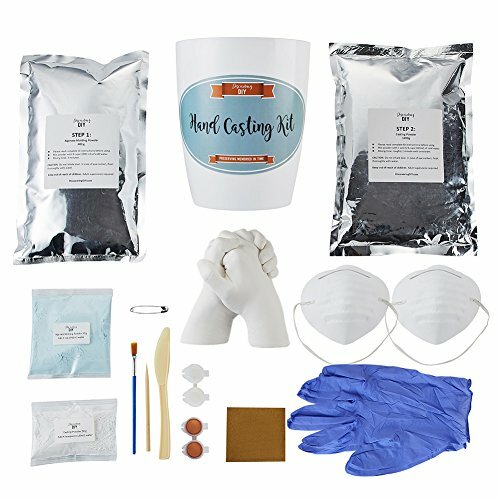 DO-IT-YOURSELF Hand Casting Kit - Finish with a clear all purpose sealant or acrylic paints (not included) or leave natural. 100% SATISFACTION KEEPSAKE GUARANTEE - If your casting does not turn out, send us a photo and we will work with you on a solution. BEST SELLING CASTING KIT with 50% MORE molding and casting powders than other 2 person kits! INCLUDED: Plastic molding bucket, 1.5lb Step 1 molding powder, 2.75lb Step 2 casting stone, fine sandpaper, course sandpaper, demolding stick, detailing pin and detailed instructions. 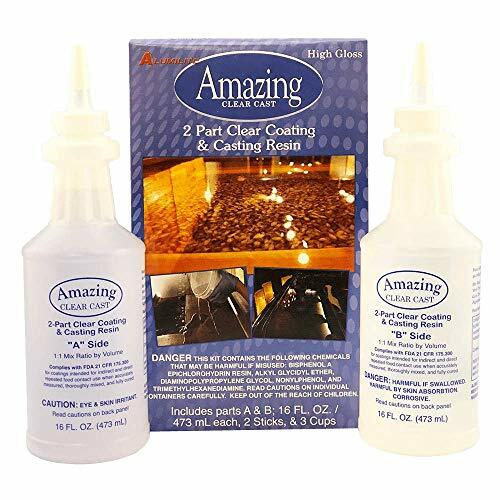 Amazing casting products-amazing clear cast resin. 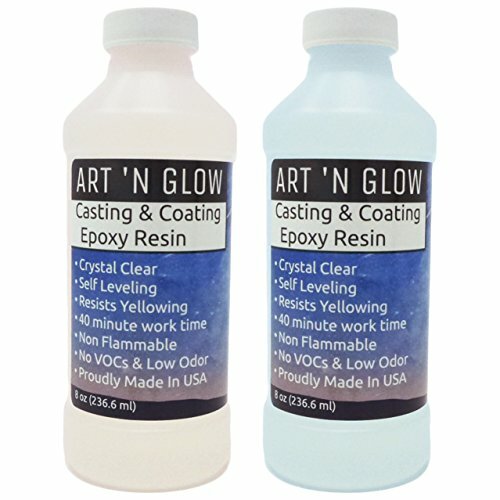 An easy-to-use 2-part multi-purpose clear coating and casting resin. Can be used for encapsulation coating or casting applications such as taxidermy bar tops potting/encapsulation hobby craft and more. This package contains 32oz of clear cast resin. Fda compliant. Made in USA. 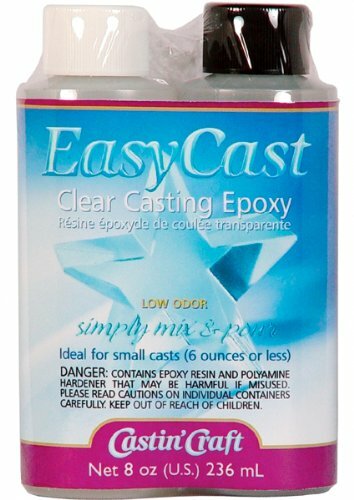 Easycast is an easy to use 1-to-1 ratio, two-component, clear casting epoxy. 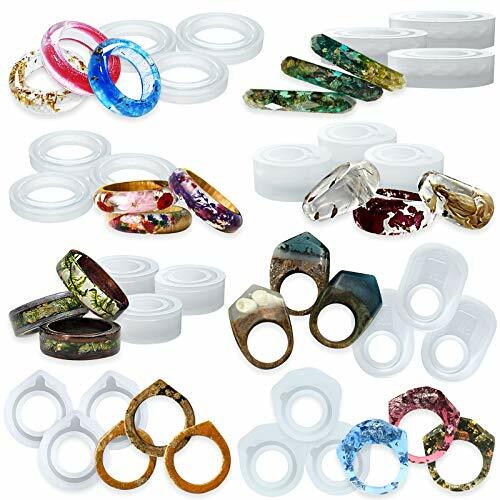 It is ideal for casting small decorative items such as jewelry, figurines, paperweights, coasters, knobs and more. Embedding or encasing items is easy and fun. Color easycast with casting' craft transparent dyes for the colored glass look or opaque pigments for solid colors. 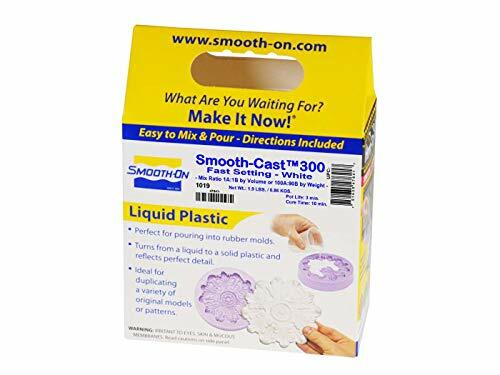 Easymold silicone putty is ideal for a wide range of impression type mold applications, including castin'craft clear casting resin, easycast clear casting epoxy, wax, baking, chocolates, ice cubes, soap, plaster, air dry clay, concrete and low melt metals. 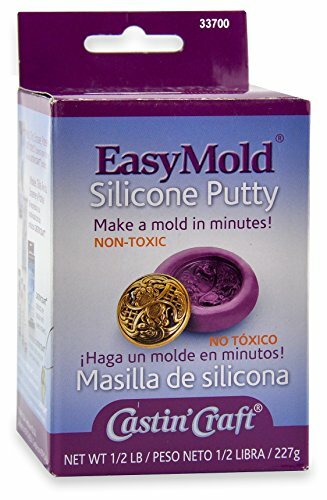 Easymold is an easy to use, odor free, non-toxic, fda compliant - food grade, two component silicone putty. Vacuum degassing is not necessary to yield castings that are virtually bubble free. 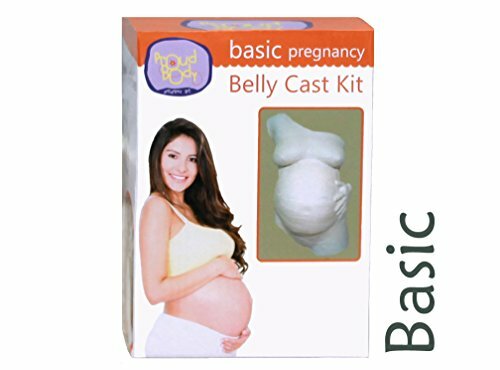 This is the pregnancy belly cast kit you should buy if you want to leave your belly cast plain white for a simple, elegant look or if you like the layered look. Unique for baby shower to create a perfect 3D memento of an expecting mom's belly or torso. Paint, decorate, or use as a baby shower sign-in. Affordable with no sacrifice on quality. Contents: 4 rolls of supeior quality casting material (20 sq ft), all-natural lubricant, gloves, 9x12ft drop cloth, complete instructions in English, Spanish and French. To use: cut strips from the plaster roll, dip the strips in water, one at a time. Then place each strip onto the casting area. Overlap the strips and apply 3 to 4 layers. Wait 5 to 10 minutes after the last strip has been placed, remove cast, and let dry for a few days. Brand: Proud Body | Manufacturer: ProudBody, Inc.
-Super Glue / Monster Glue - Non expanding glue with a permanent bond. Prep base by sanding the area of adhesion. -Epoxy - Prep base by sanding the area of adhesion. -Tacky Wax - A generous amount of tacky wax holds the statue on very well and leaves the option of a clean separation at a later time. 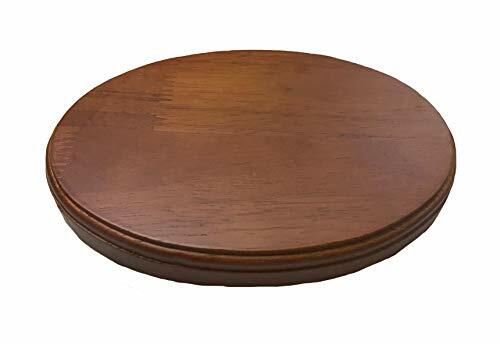 Dimensions: Overall 6.75 x 4.75 diameter (with a usable display surface of 6.5 x 4.5 inches). Adhesive Options: Super Glue / Monster Glue / Epoxy - Non expanding glue with a permanent bond. Tacky Wax - A generous amount of tacky wax holds the statue on very well and leaves the option of a clean separation at a later time. With MORE THAN DOUBLE THE MATERIALS of our Standard kit you will be able to cast up to 6 hands with this extra large kit! What is involved? Those involved in the casting will be required to maintain the casting bucket for about 2-5 minutes. You will not need to be completely motionless the entire time, but you will not be able to leave your position in the casting bucket. Although one person can do it, we recommend that there are 2 people available to assist with the casting process. You will need a small table or stool that can be accessed easily and comfortably from all sides. Other than that, you need water, some mixing bowls, large spoons and the willingness to possibly get a little messy. 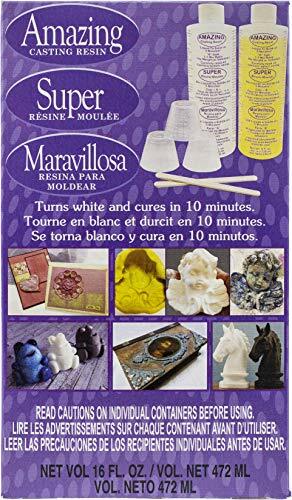 Included in the Kit: Create-A-Mold molding powder, plaster casting stone, durable reusable bucket, sanding screen, de-molding stick, demolding spook, detailing pin, sanding paper, directions, link to online photo directions. UNIQUE molding process creates an exact replica with fingerprint detail. Our custom formula alginate molding material will capture every precious detail while keeping high strength. Create LIFE-LONG MEMORIES to share with you loved ones and friends. CELEBRATE anniversaries, weddings, friendship, family and loved ones of all sizes and ages. High quality DO-IT-YOURSELF kit with detailed instructions. Bucket dimensions: 10 inches tall and 10 inches in diameter. Click to watch a detailed video that goes through every step of the hand casting kit process. Great for graduation, birthday, anniversary, engagement or baby shower gift. 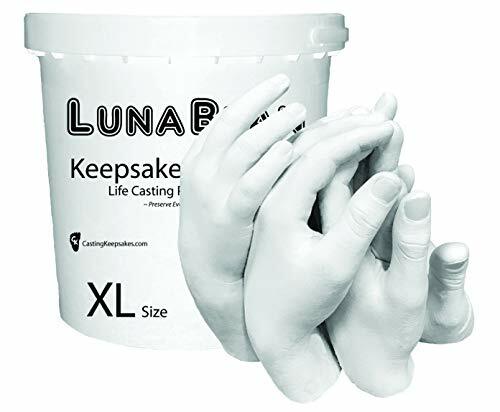 The hand hold casting kit is a fun way to create lasting memories. Our kit is the most complete hand mold kit available on the market . You will receive a large hand casting bucket, step 1 alginate molding powder, step 2 casting powder, practice step 1 alginate molding powder, practice step 2 casting powder, two protective masks, a pair of latex-free nitrile gloves, sandpaper, a wood detailing stick, a safety pin, a plastic de-molding knife, bronze acrylic paint, clear sealant, a paint brush and detailed instructions. We include so many extra items, because we want you to have the greatest experience possible. You will need to use a large mixing bowl, a measuring cup and a whisk or spoon with our kit. We provide all other items needed to create an amazing casting. 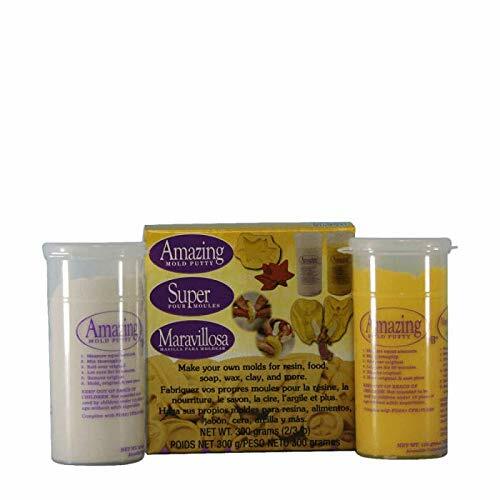 We include practice alginate molding powder and practice casting powder in the kit so you can become comfortable working with the materials before you make your full hand casting. 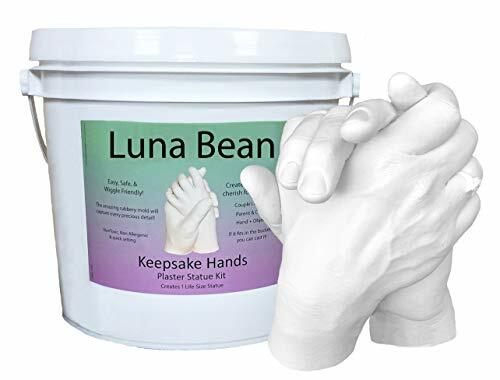 This kit provides the materials to create the following castings: 1 adult hand, 2 adult hands, 1 adult and 1 child, 2 to 3 children, or 1 adult and one pet paw! 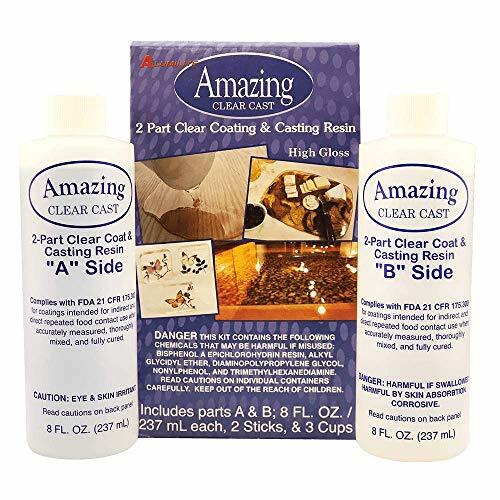 Bronze acrylic paint and clear sealant are included with your kit to create a great finish for your casting! The clear sealant will seal and protect your casting which is very important if it will be handled by many. The bronze acrylic paint gives your casting a unique finish that will make others notice and comment. ALUMILITE AMAZING CLEAR CAST (32OZ): Easy to use and long lasting. This package contains two 8 ounces bottles of clear coating and casting resin (mix portions out of each bottle together in order to create a casting). It is used to make extremely detailed designs out of your Amazing Putty mold or as a protective layer of furniture and more. Includes 16oz Part A and 16oz Part B. Made in USA. 20 MEASURING CUPS: 20x 10oz (8oz markings) Solo Disposable Graduated Clear Plastic Cups With Measurement Readings. 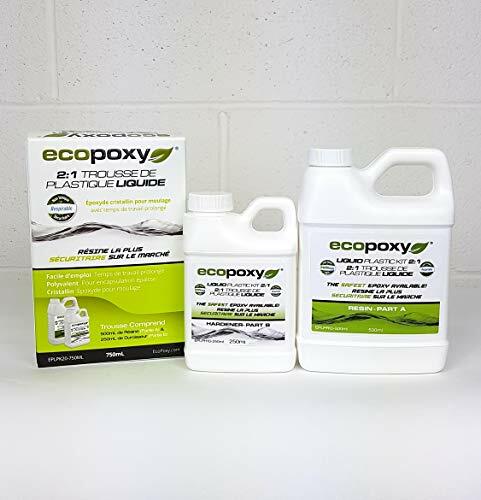 Perfect for mixing paint, stain, epoxy, resin and more. 20 WOOD MIXING STICKS: 20x 6-inch Pixiss Stix Wood Mixing Sticks. Premium mixing sticks. 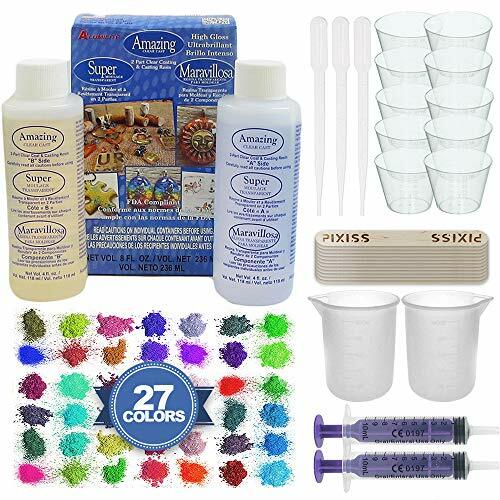 Amazing Clear Cast Bundle - Amazing Clear Cast Resin 8-Ounce, Pixiss 27 Colors Resin Tinting Mica Powders (Assorted Colors), Pixiss Mixing Sticks, 2X 100ml Silicone Measuring Cups, 2x 10ml Syringes and 3X Pipettes. ALUMILITE AMAZING CLEAR CAST (8OZ): Easy to use and long lasting. This package contains two 4 ounces bottles of clear coating and casting resin (mix portions out of each bottle together in order to create a casting). It is used to make extremely detailed designs out of your Amazing Putty mold or as a protective layer of furniture and more. Made in USA. 27 MICA POWDERS - Pixiss Mica Powder Pack. 27 different colors in 5g bags (assorted colors). Use these powders to tint your Amazing Clear Cast for jewelry and more. 135g total. Colors chosen at random. 10X 1OZ CUPS: 10x 1oz (8oz markings) disposable graduated clear plastic cups with measurement readings. 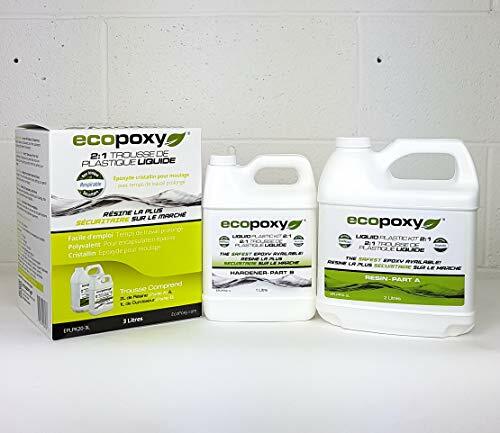 Perfect for mixing paint, stain, epoxy, resin and more. SYRINGES & PIPETTES- 2x 10ml syringes to place your resin in even the smallest and tightest of molds. PIPETTES - Included are 3x 3ml pipettes for dropping the perfect amount of liquid. Liquid Plastic is a high performance, natural and bio-based, 100% solids, two component, commercial grade epoxy formulated for a long gel time, low exothermic heat buildup. At a 2:1 ratio, Liquid Plastic will cure with a hard finish that will resist scratch and will not crack. Liquid Plastic can be poured at any thickness and cures to a water like appearance. Liquid Plastic is perfect for casting and see through encapsulation of objects such as Coins, Photos, Wood, Metal, Concrete, Granite, Copper, Stainless Steel, Bamboo, Leather, Ceramic, Artwork, Rocks, Sea Shells, Fabrics, Paper, Dried Plants and much more Liquid Plastic is crystal clear and brilliant; it accentuates and magnifies the objects it encapsulates. Liquid Plastic is a product you can trust, and truly beautiful to behold. 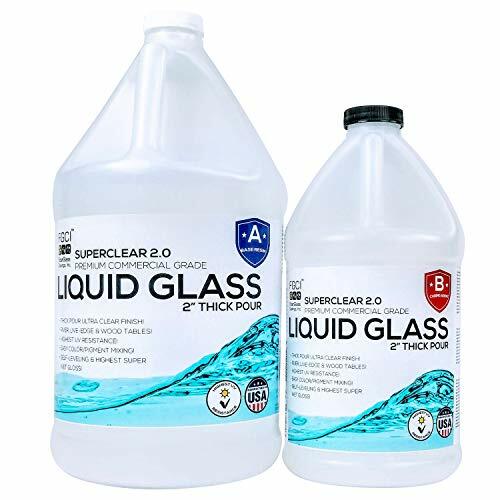 Our SuperClear 2.0 Liquid Glass 2" Thick Pour is the newest version of Superclear and is the EASIEST WOODWORKING EPOXY RESIN on the market! This is the clearest curing, best UV resistant clear thick casting pourable epoxy resin system out there! With the ability to POUR UP TO 2 INCHES THICK in one sitting, no more are the days of pouring multiple coats, and you can forget about sanding between coats! Epoxy Resin Wood Table Top Diy! Epoxy River Coffee Tables! Epoxy Resin Coffee Tables! Colored Epoxy For Wood! Epoxy Resin Wood Art! Epoxy Resin Dining Table! Resin Geode Art! Resin Wood Art! And More Cool Epoxy Projects! Easily mix a 2:1 ratio of Base Resin A Side with the B Side Curing Agent. Pour Each side into a separate cup, then combine in a third mixing container. Mix the contents for a MINIMUM of 3 minutes, but 5 minutes is the recommended time to mix. Working time is 1 hour at 77 degrees Fahrenheit, giving you plenty of time to perfectly mix your epoxy resin pigment powder to create a colored epoxy for wood. Cure time is longer, which enables a thicker pour with a bubble free tough, durable, wet gloss, beautifully crystal clear epoxy resin finish! Total cure time: 36-48 hrs. To get rid of surface bubbles, use a heat source (heat gun, blow torch).  HIGHEST EPOXY RESIN UV PROTECTION! Our SuperClear Liquid Glass 2" Thick Pour Has The Highest UV Yellowing Resistance Out Of All Competitor's!  HIGHEST PERFORMANCE LEVEL! SuperClear 2.0 Is Considered The Best Epoxy Resin For Wood, Table Diy, Countertops, Tabletops & ALL Epoxy Table Ideas! 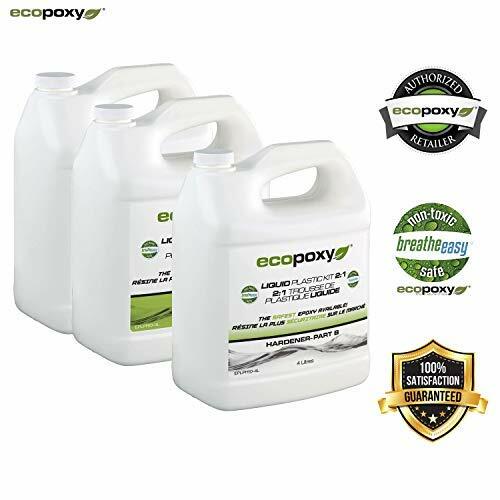  EXCELLENT FOR Colored Epoxy Resin Wood Filler Applications, Or As A Clear Epoxy Resin Wood Filler & Filling Large Voids In Wood With Epoxy POURING UP TO 2 PLUS!  WORKS AMAZINGLY With Metallic Epoxy Pigment! Mixes Flawlessly With Epoxy Resin Color Pigments, Mica Powders Like Black Diamond Pigments & Creates A Superb Colored Epoxy For Wood!  SUPERCLEAR 2.0 IS MADE IN THE USA! PRACTICALLY ODOR FREE! ZERO VOC's! 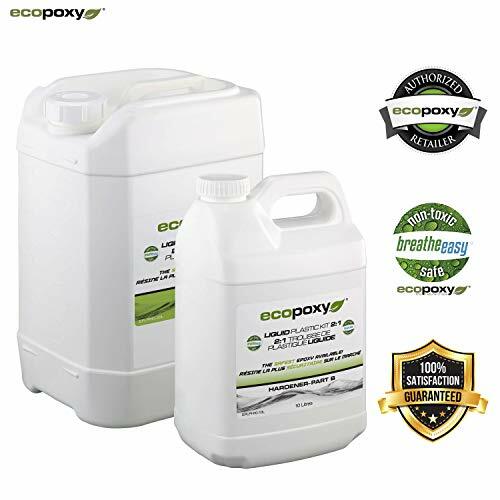 Ecopoxy Liquid Plastic 750ml - 2:1 Ratio Sold by OM Creation Inc. Liquid Plastic 2:1 is a high performance, 100% solids, two component, commercial grade epoxy formulated for a long gel time and low exothermic heat buildup. Liquid Plastic can be poured up to a maximum thickness of 1.75 and cures to a water like appearance. Liquid Plastic is perfect for casting and see through encapsulation of objects such as Coins, Photos, Wood, Metal, Concrete, Granite, Copper, Stainless Steel, Bamboo, Leather, Ceramic, Artwork, Rocks, Sea Shells, Fabrics, Paper, Dried Plants and much more Liquid Plastic is crystal clear and brilliant; it accentuates and magnifies the objects it encapsulates. Liquid Plastic is a product you can trust, and truly beautiful to behold. Smooth-On Epsilon PRO is a thixotropic epoxy coating that self-thickens for brushing onto a variety of surfaces. Applied in thin layers, mixed material holds a vertical surface without sagging or slumping. Material wets out uniformly over different surfaces. Epsilon PRO is clear and can be easily colored using Ignite or UVO colorants. Cured coating has a gloss finish and can be sanded, primed and painted. Epsilon PRO is suitable for use as a protective, impact resistant coating for EPS or polyurethane foam. It can also be applied to plaster, concrete, wood and fabrics. This product is not sensitive to moisture / humidity and contains no VOC's. 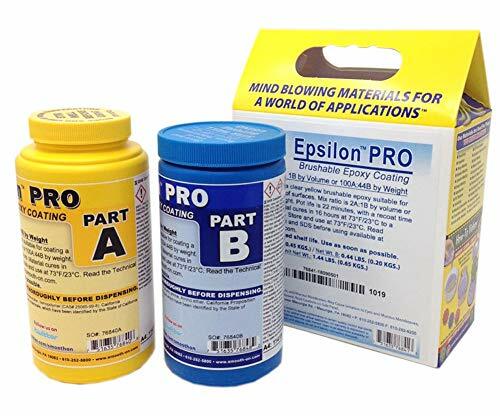 Epsilon PRO is suitable for use as a protective, impact resistant coating for EPS or polyurethane foam. It can also be applied to plaster, concrete, wood and fabrics. This product is not sensitive to moisture / humidity and contains no VOC's.